Here’s finishing off the trip, so this recaps Sunday. Was too tired to write when we got home last night. Sunday morning we got up in the dark, which of course you have to do it it’s before 10:30. Ellen had selected a place for breakfast in the centre city, Bergsoon Mathus. We arrived around 8:45, to get a very nicely delivered explanation that while they opened at 8, their chef had not made it into work yet. I guess it was Sunday morning! So they said they could put a plate of bread and meat/cheese/tomatoes together for us. We weren’t looking for a big breakfast, so took what was available. Just wondering how much longer that chef will be employed. 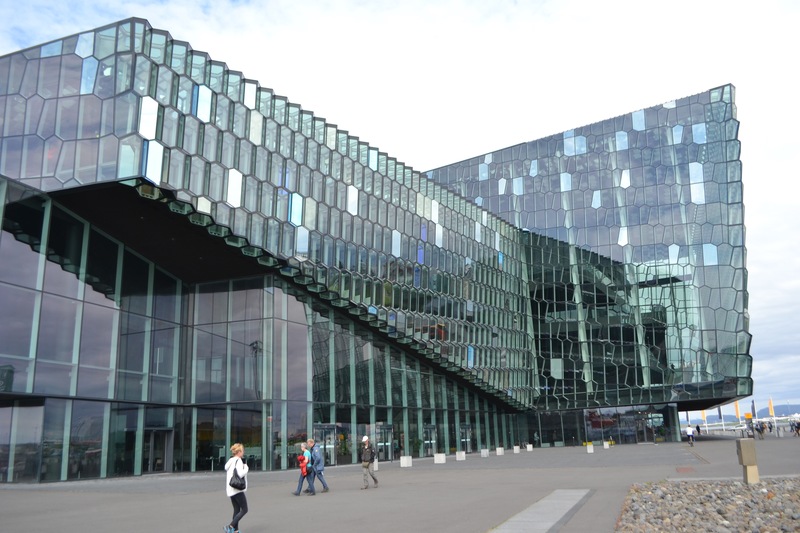 Our destination for the morning was the Reykjavik Art Museum. The museum has 3 locations, we went to the modern museum, Hafnarhus, which is right on the harbor. There was an awesome exhibit on the ground floor Erró. The cartoon style belied the heavy theme of war in his art. Yoko Ono had a participatory display, where you could put a wish on a tree, write about your mother, paint and pound a nail. Never will get her art. It was definitely a museum worth visiting. We hustled back to our AirBnB to gather our stuff, caught the FlyBus to the airport, and then had plenty of time to file for our VAT tax refund, get through security, and do some duty free shopping. We picked up some more Havana Club rum, now that it’s legal to bring it into the country from countries other than Cuba. I bought a few 66° North hats. We had lunch with Robyn and then said our goodbyes. I did like the Dyson combination sink and hand dryer in the bathroom, have not seen this in the US yet. The 6 hour flight allowed me to watch 3 movies. There was a 2016 movie called Reykjavik, so I thought I should watch it. It was really good, I recommend it. Here’s the trailer. I then wanted something light, so watched Caddyshack. Pretty much as I remembered it. Lastly, had never seen Bonny & Clyde. Global Entry again breezed us through Immigration. Almost too fast as we needed to wait for our luggage, which came out in the latter half. But then we could get through Customs quickly too. Had to wait for shuttle to our car, but were home just after 8:30pm EST. 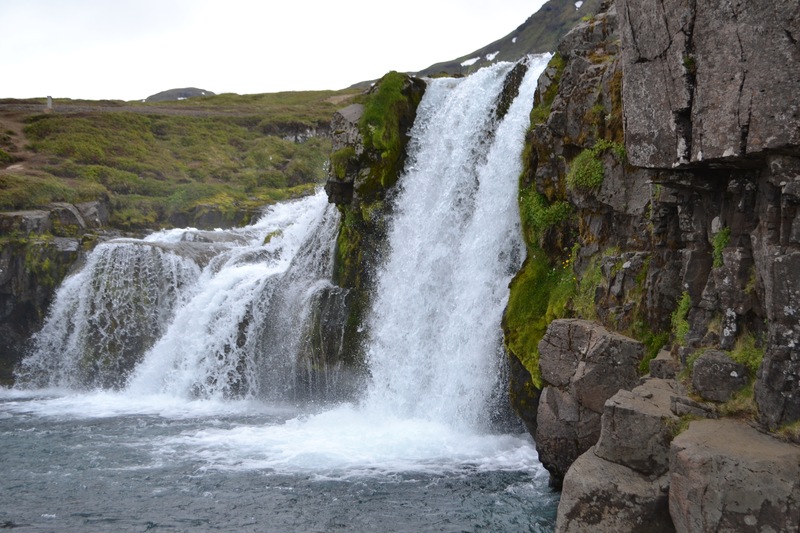 Iceland once again was inviting, pleasant, friendly and fantastic. We didn’t have any difficulties, everyone we came in contact to was nice, and we enjoyed everything we did. Seeing the Northern lights was a real bonus, as we heard they had been elusive lately with cloudy weather and we snuck in just when the skies cleared. I think we’ll continue to go back, maybe throwing in a day trip to Greenland and a trip all the way around the island. When visiting a country you have been to 3 times previously, it’s pretty easy to hit the ground running. We got on the plane and slept. We landed and knew just where to get our SIM cards (Arrivals Duty Free store, ask the cashier, Nova cards). We knew where to catch the FlyBus to the Blue Lagoon. What was different this time was it was dark. We landed at 6:30am, were on a 7:30 bus to the lagoon, arrived there at 8, and got out of the water just around 10:30am…when it was just starting to get light. It was cold and windy and rainy, but with 100ºF water, it was still really comfortable and relaxing. But you miss seeing the moonscape-like lava fields on the way in from the airport. We then bussed into the city, found our AirBnB (our first time using it), met up with our friend Robyn who had arrived one day early, and headed into town. It’s never a mystery what my first desired stop is. Got to visit the new flagship store. But since I own 3 jackets, a shell, a hat and a t-shirt, there really wasn’t anything compelling to buy. So I bought a pair of socks. We walked more through town, which just feels like home at this point. Like seeing City Hall. The Christmas decorations are up, and since there are only 5.5 hours of light now, they get to be lit up a great deal. Ellen had picked a tapas place that Ben had recommended to us, Tapas Barinn. Fairly traditional tapas, a good amount of fish offered. We were supposed to do a Northern lights tour tonight, but it was canceled due to the weather. Although the lights were a big part of coming in November instead of our traditional summer visits, we had read that the weather can be uncooperative, so you shouldn’t have your heart set on seeing them. So we don’t. We have two more shots the next two nights, but we’ll see what happens. 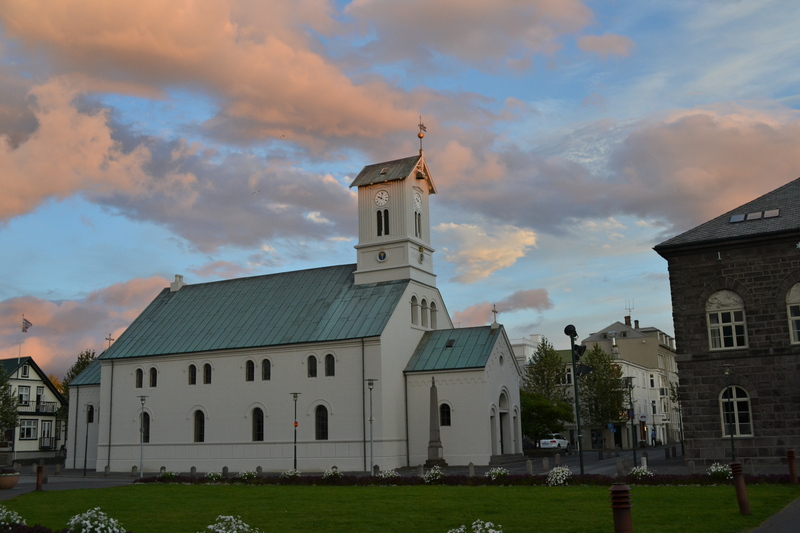 We have museums scheduled for tomorrow and the Golden Circle tour for Saturday. On the way home from dinner, we had to walk by the hot dog stand made famous by Bill Clinton. Hope everyone back home is having a happy Thanksgiving! 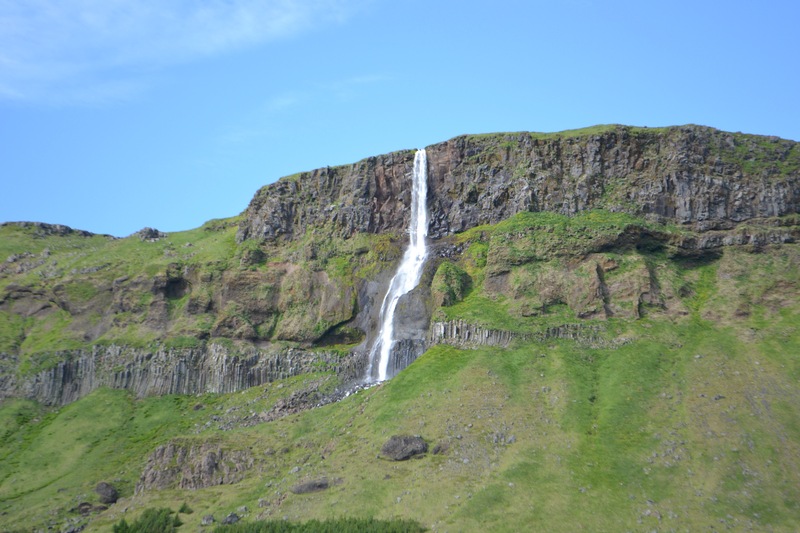 Denmark/Iceland Day 8: Now with Iceland! We changed countries fairly easily. And our car rental for the day was a Hyundai i30, so not much changed! Before we get too far, the poll yesterday. Of 21 votes, 14 of you guessed $45-55. 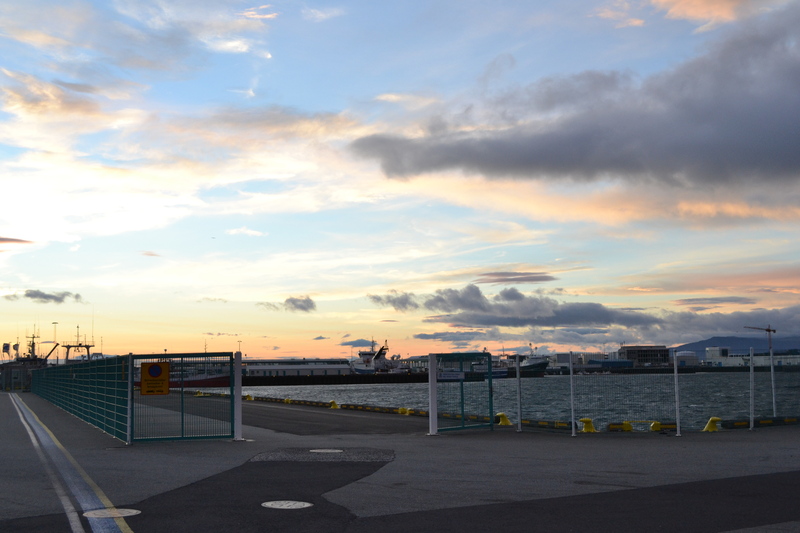 And you were right, the toll was around USD $55 EACH WAY between Copenhagen and Malmo. We found out there is also a train right from the airport to Malmo. Maybe next time! 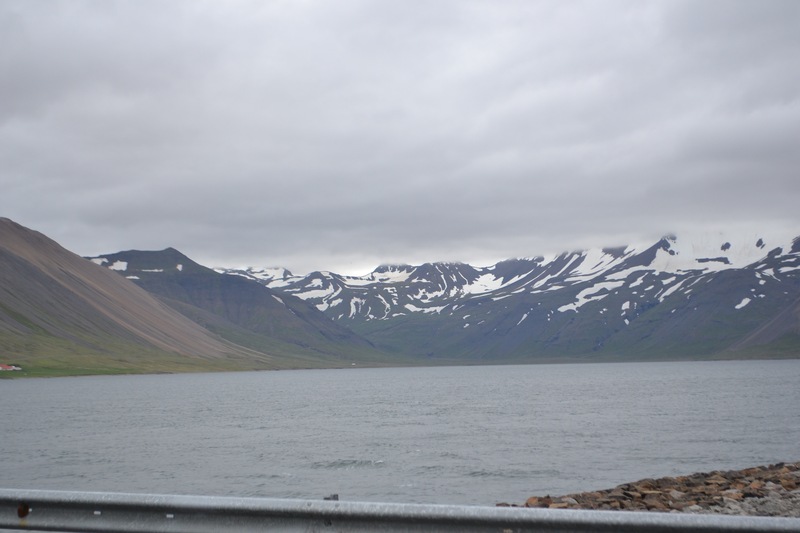 Today was the first time in our 3 visits to Iceland that we rented a car and did our touring by ourselves. In the past we had used a tour company, but they were sold out for the western coast this time, so we decided to do it ourselves. Pixels will not do it justice, but here is a taste of what we saw today. 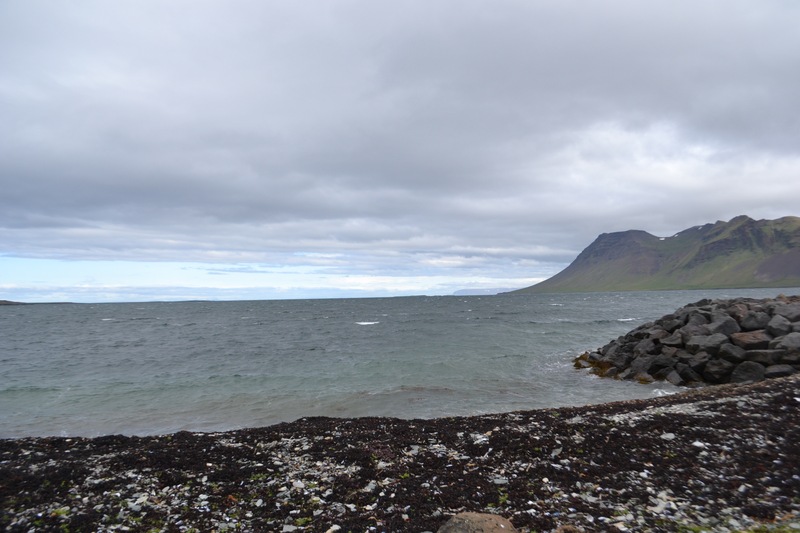 The temperature varied from 8-14°C, overcast, windy, and it was still just breathtaking sites. 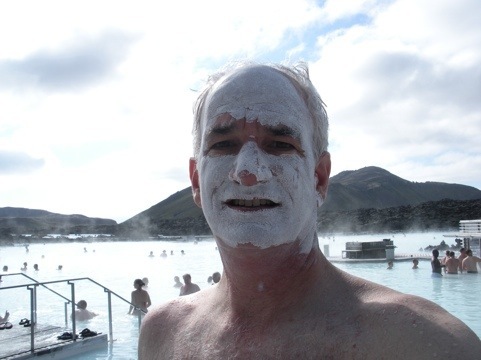 We drove back to Reykjavik and checked into our Planet Aparment place. New for us, quieter part of town, looks really nice. We have a few favorites from our past visits, and we took quick advantage of them. 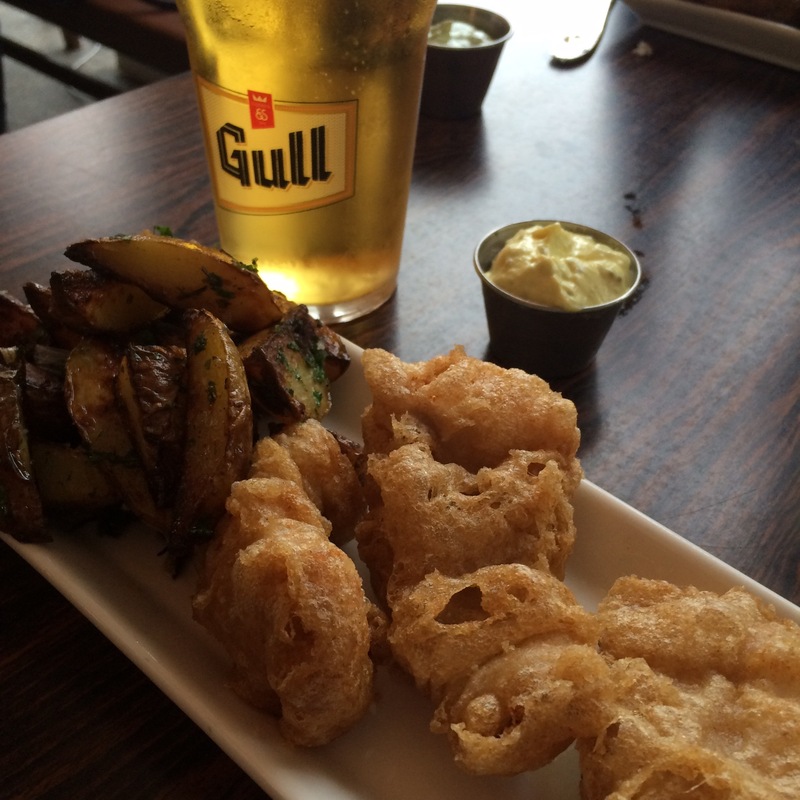 First was Icelandic Fish & Chips for dinner. They have moved to a larger, brighter space. Food still as good. 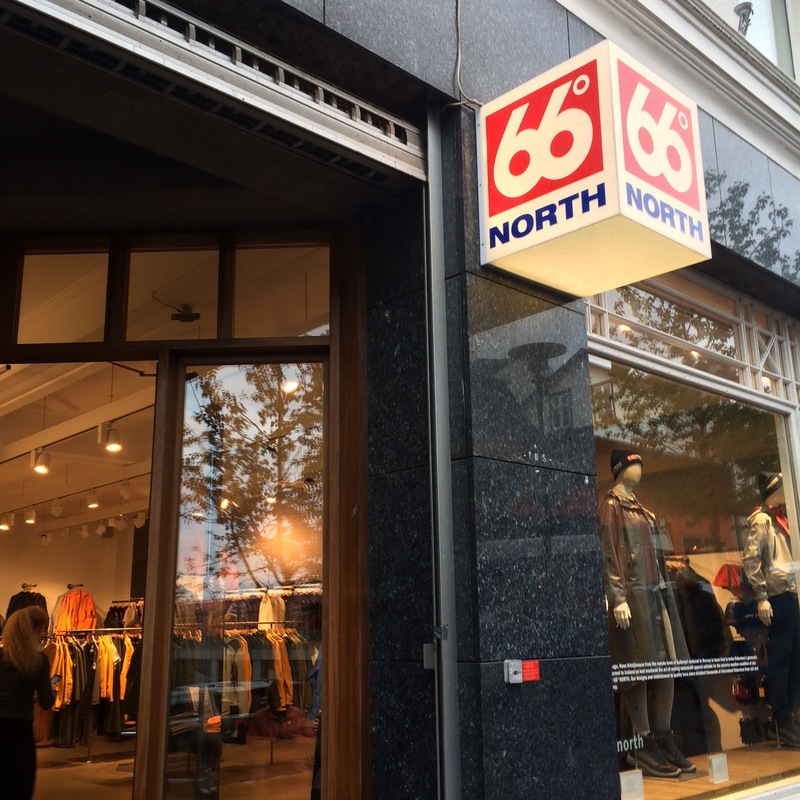 Next was my favorite outerwear store, 66° North. We both got jackets there. 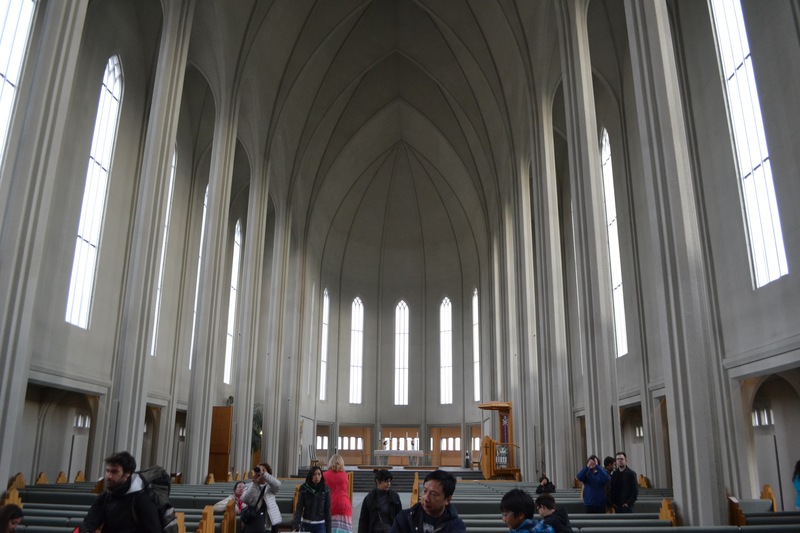 Finally we walked up to the church, because it is just such a great visual site. A good full day! Today was an easy day to write about. 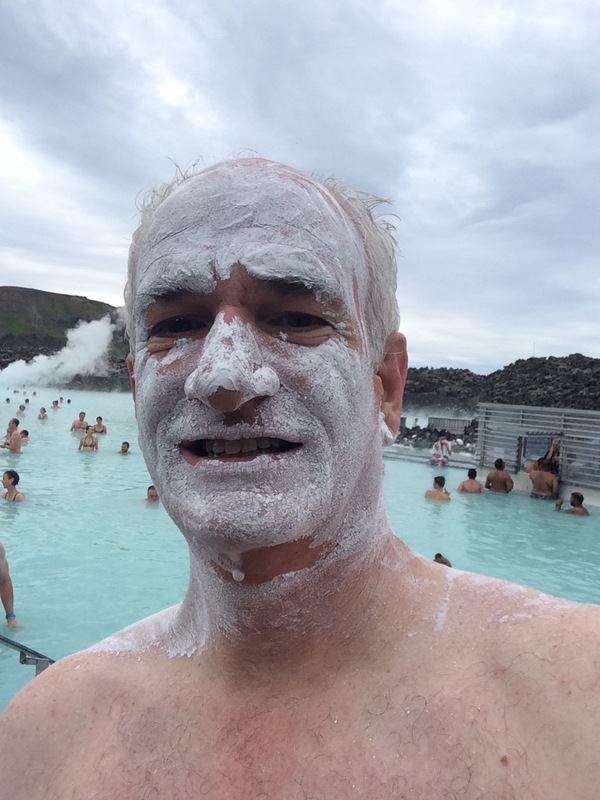 We got up, packed up and took a van to the Blue Lagoon. 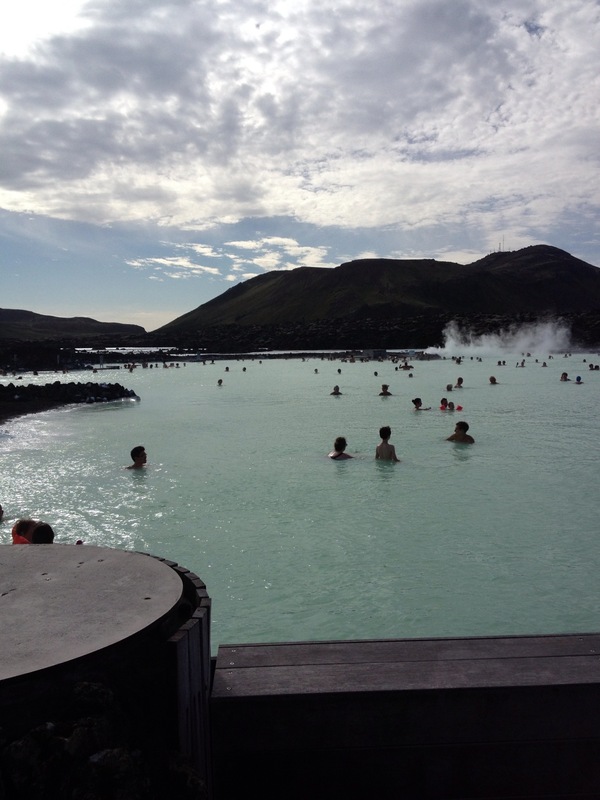 Located just 20 minutes from the airport (and 40 minutes from Reykjavik, Blue Lagoon is a spa, fed by geothermal water. They are set-up to make it easy to stop there either on the way to or from the airport. We had made it the last stop of our vacation two years ago, and decided to repeat the visit. Even though it was 55 degrees, overcast and with another vicious wind, you could stay in the water and it felt great. And this year as a special treat, Ellen put some tutoring money to cover in-water massages. They put you on a float, put a towel on top of you to keep you warm, and gave the massage while you lay on your back. It was 30 minutes of heaven! 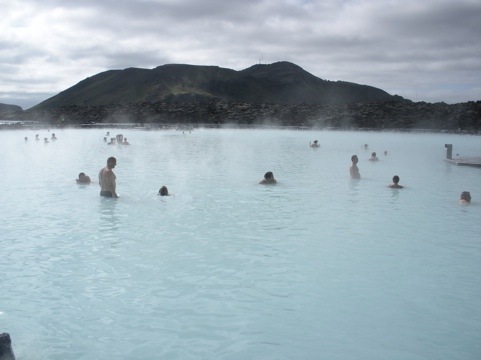 Blue Lagoon is known for all sorts of minerals. They have silica available, that you let dry on your skin. Here is the obligatory picture. We then shuttled to the airport. We took care of getting our VAT refund, buying a couple of things in the duty free store, hanging in the lounge, then waiting for our flight. It was about 1/2 an hour late because of a computer problem with the boarding computers, but otherwise a fine flight. Feels good to be home. Back to work tomorrow! In fact, going through Immigration, I was asked my occupation. Then my industry. Then my company. When I said FrontPoint Security, the agent said he was a customer and loved his system! That was a nice welcome back. 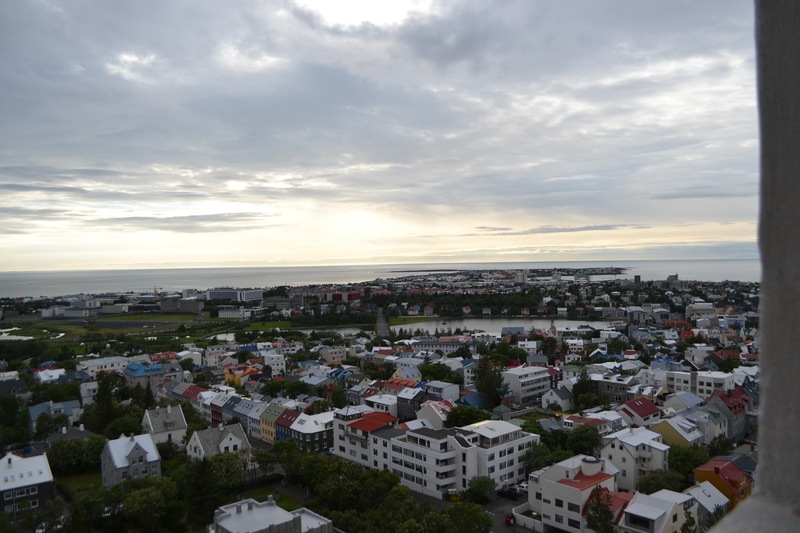 So hard to believe we woke up in Linköping this morning and are now in Reykjavik. We slept well, even though our hotel was on the main square. After breakfast, I took a quick walk around the square to take pictures. 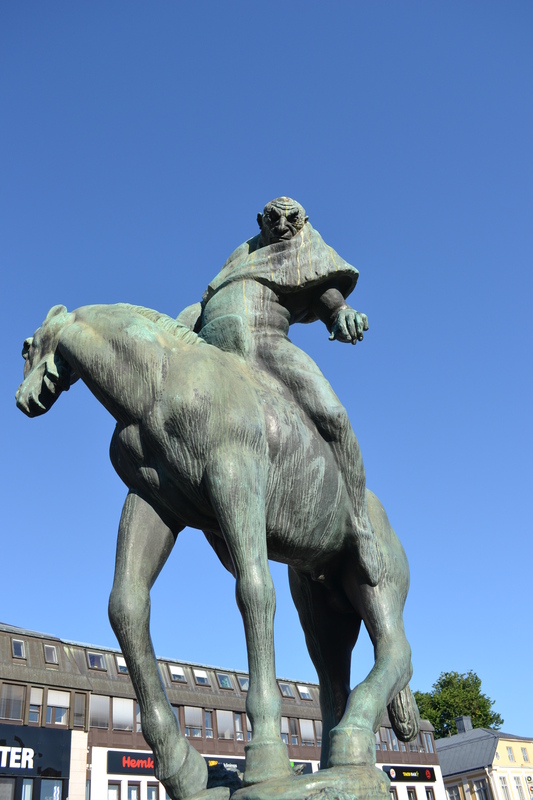 This statue caught my eye. Will have to research the story (or depend on one of my librarians friends) when we get back. The drive back to Stockholm was easy. We returned the car and checked into our flight. Flying between European countries is so easy now, no customs or immigration. You can even keep your shoes on going through security! 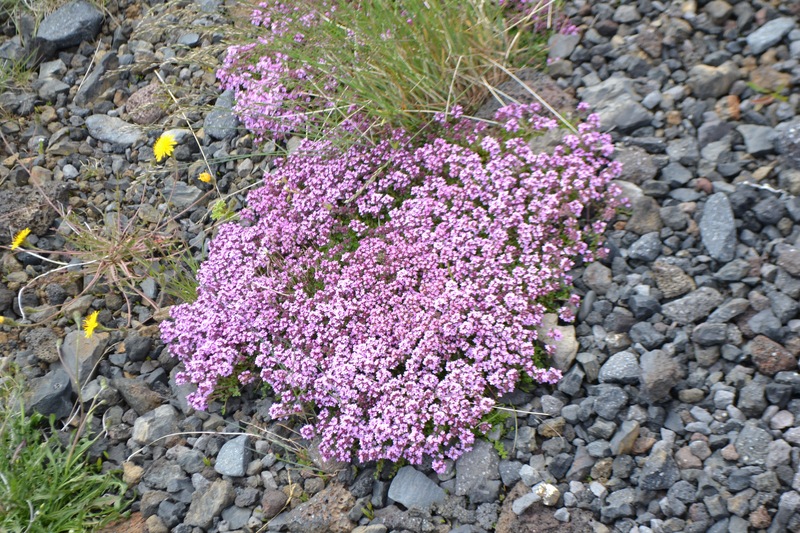 A short 3 hour flight later, we were in Iceland. Ellen absolutely fell in love with it from our first visit. 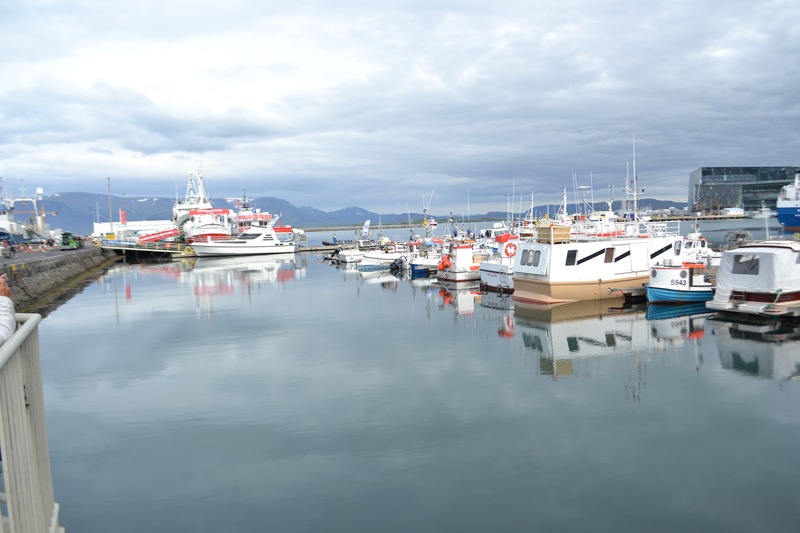 There isn’t a lot to see in Reykjavik. Even less when it is 50 degrees with a fierce wind. 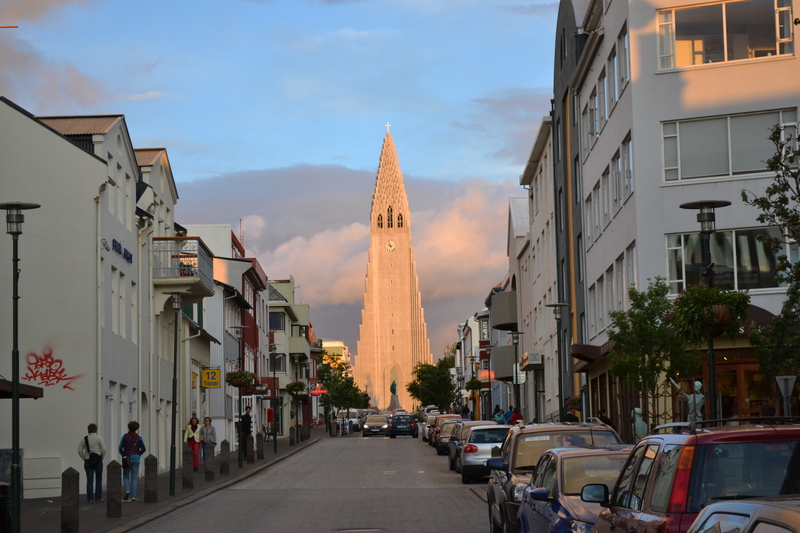 But the Hallgrímskirkja Church is a tremendous sight, even more so tonight with the clouds glowing an orangish color. Our first (and my largest) priority was a visit to 66°NORTH, an Icelandic clothing company we had discovered during our last visit. Their clothes are expensive but exceptionally light and warm. And they are not The North Face, which everyone and their brother wears. We each got several items. 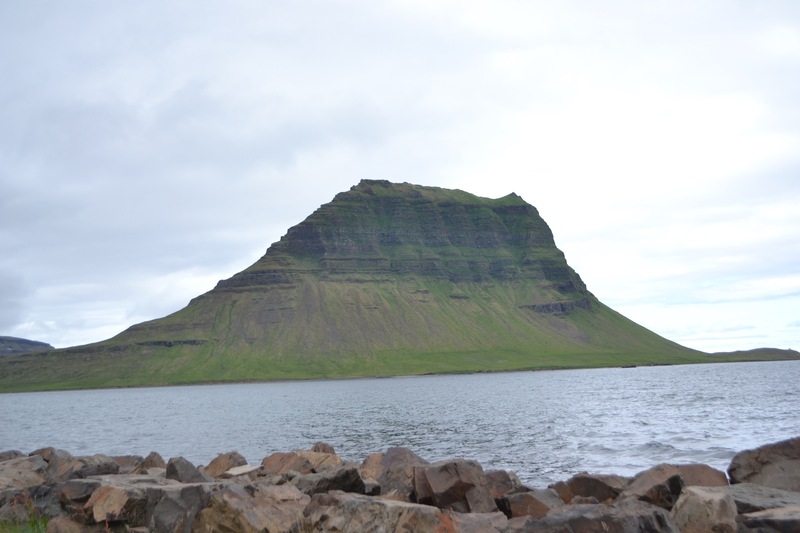 We took a quick walk through town, and then went to dinner at Sjávargrillið, a seafood restaurant in town. We had eaten at a really fancy seafood restaurant last visit, but it had closed. 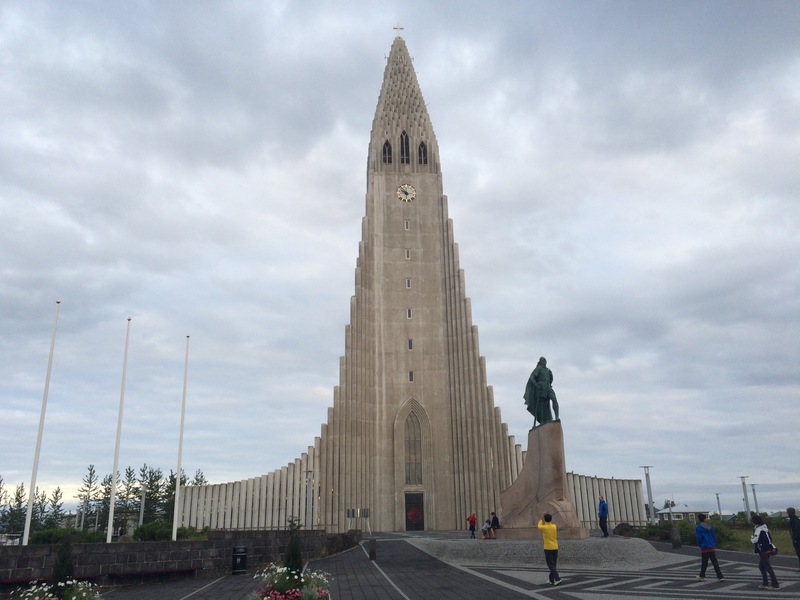 Sjávargrillið was a little more touristy, but the hustle and bustle (and American tourists) were more than compensated for by great food. We both had salmon, with all sorts of interesting things included. 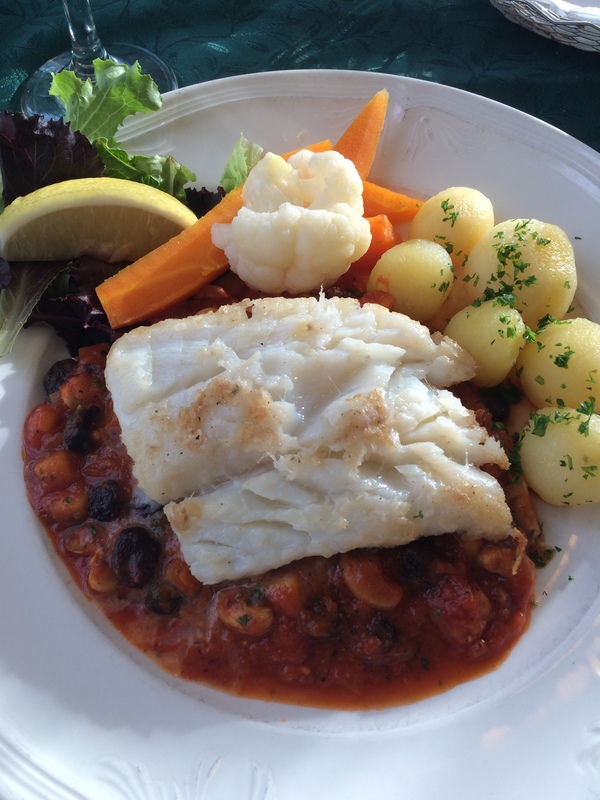 Just take a look at the pictures of their dishes! It was too windy to walk around much after dinner, and we were a little tired after getting back 2 hours by heading west. So we walked down by the water and snapped a few pictures before heading to bed. The sun doesn’t set until after 10:30 here, so still light even late. So all good things, and this vacation was really good, must come to an end. We checked out of the hotel, but had one last stop before coming home. 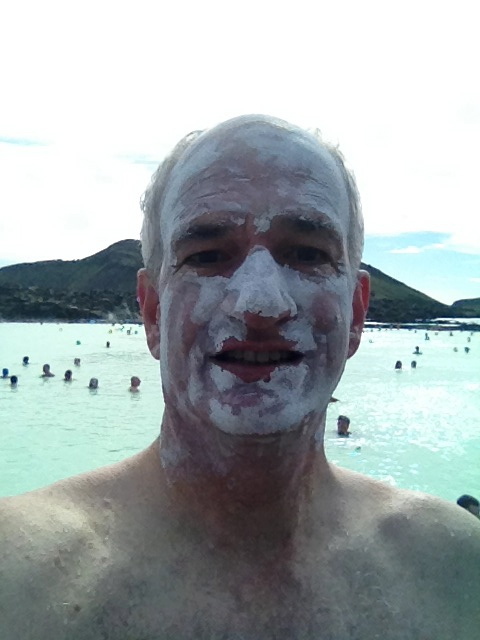 We took a bus to the Blue Lagoon. 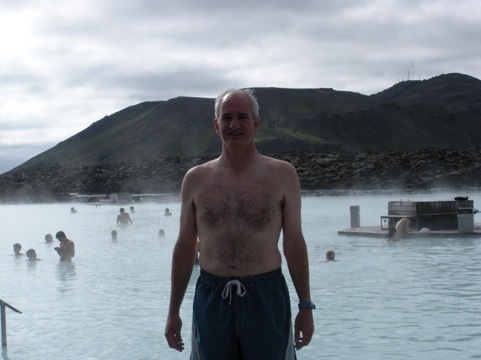 It is a man-made lake/pool, filled with the geothermal water. It is located close to the airport, so they are set up to store your luggage. It’s a high tech operation, where a wristband with a chip gets you in, locks your locker, and you can even buy drinks and charge them. 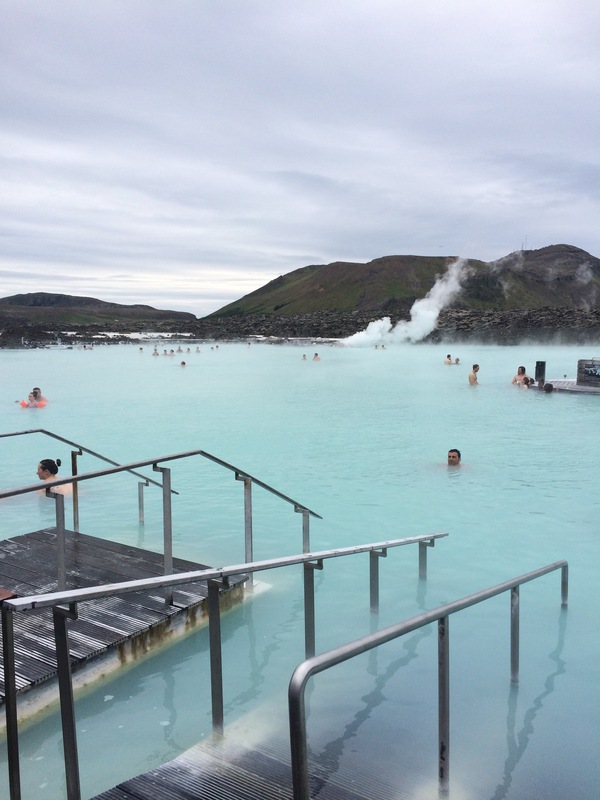 The water varies in temperature, from warm to hot, the bottom is uneven so you have to be careful, and they feature a silica/mud mixture that you can use to exfoliate. It was a great place to relax before heading home, as we don’t really do that on our vacations. After being in the water for about 1.5 hours, we showered and had lunch there. Our bus then takes you from the lagoon to the airport. We had no trouble checking in, did a little shopping at the airport, then took advantage of Icelandair’s lounge before our flight. We again had business class seats for an economy comfort price, which was a great deal. We got in to Dulles about 7:15pm, and the passport/luggage/customs thing worked out fine. We had to wait about 20 minutes for a bus to the Hampton In where our car was parked, but paying $20 for 12 days of airport parking made that worth it. We were home before 9:30, to chat with the kids before collapsing. I have been collecting thoughts from the travel here, will be adding to them as things occur to me. I’ll probably have one more wrap-up post in a day or two.